spring turkey season to claim our hearts. We called her Babe and she changed our lives forever. but when we learned she was part vizsla, our search was on for a breeder. Mary Jane Whaley and her Topaz Vizslas. "Topaz Brazen Rock JH, CGC"
is honored in our kennel name today. and the opportunity to meet so many wonderful Vizsla people across the country. Over the years we've enjoyed overwhelming fun and success with our dogs and their offspring. We breed occasionally and strive to maintain versatility and integrity within our pedigree. We welcome you to contact us regarding future litters, or questions you may have about the breed. 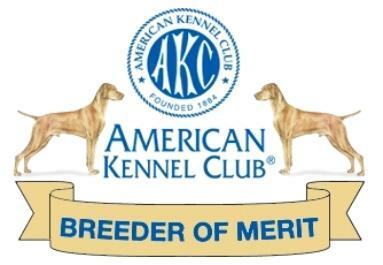 We're proud and honored to be recognized as an AKC Breeder of Merit.